Wine Lovers of NYC was started as a club of New York City wine lovers on Meetup.com in 2014. We took over the group in early 2015 and have grown the group to more than 4000 members. Wine Lovers of NYC has become one of the most popular venues for New Yorkers interested in learning about and enjoying good wines. We hold regular tastings at Pierre Loti Wine Bars and other venues throughout New York City. And we present corporate and private tastings throughout the New York area. Our tastings are both intimate tastings of fine wines guided by some of the leading wine experts in the world and larger walkaround tastings where attendees can sample many wines in a party atmosphere. We also help promote charity wine tastings and occasionally larger events held by partner organizations. Barney has been appreciating quality wine for most of his adult life. First learning about it during his student days in Europe, he has devoted much of his free time to learning about and appreciating good wine, especially from lesser-known, high-quality winemakers in Europe and the US. Since 2003 Mr. Lehrer has owned a residence in the Rhone valley, which serves as the base for visiting famous and less famous (but high quality!) winemakers. When he is not there he is happy to share the place as an ideal Rhone valley/Provence vacation base. Barney has a Certificate in Wines and Spirits from the Wine and Spirits Education Trust of London, “the foremost international body in the field of wines and spirits education”. He is a graduate of the University of Massachusetts and holds an MBA from the Thunderbird School of Global Management. Before entering the international trade profession, Mr. Lehrer was a Europe and Juilliard-trained professional cellist performing frequently in the US, Europe and North and South America. ​A leading wine educator, international wine judge, wine writer, and sommelier, Robin Kelley O’Connor is the lead consultant and wine expert behind Wine Lovers of NYC. His thirty years of experience, authority and passion enable captivating seminars, dinner events and wine education and allows him to offer an unparalleled suite of services to corporations and individuals from around the world. Robin serves as the wine instructor at the International Culinary Center, the leading culinary educational institution in New York City. He was previously Lead Specialist & Head of Wine, Americas for Christie’s Auction House. He is a Christie’s trained charity auctioneer. Prior to Christie’s, he was Director of Sales and Education for Manhattan wine and spirits retailer Sherry-Lehmann, winner of Wine Enthusiast Magazine’s 2010 Wine Retailer of the Year Award. Preceding Sherry-Lehmann, he was Trade Liaison and director of trade and consumer education in the Americas for the Bordeaux Wine Bureau (Conseil Interprofessionnel du Vin de Bordeaux) for 20 years. 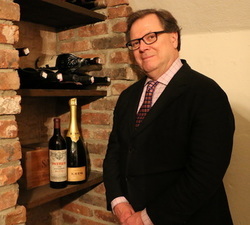 Robin also has worked with Italian Wine Merchants (IWM), where he was the Director of Education, resident Bordeaux expert, weekly contributor to the IWM blog and "Expert Picks," as well as a member of the editorial team for the daily IWM e-Newsletter. Robin holds Certified Specialist of Wine (CSW) and Certified Wine Educator (CWE) certifications from the Society of Wine Educators and passed the Court of Master Sommeliers’ Certified Sommelier exam. O'Connor served as president of the Society of Wine Educators from 2003-2007, is on the board of directors of the New York Chapter of the American Institute of Wine & Food, and has been a regular panelist at the Food and Wine Magazine Classic in Aspen for 20 years. As a popular wine educator and spokesperson, he has conducted over 2,500 seminars; written for the Trenton Times, Santé Magazine, Wine & Spirit; and served as senior editor for Kevin Zraly’s Complete Wine Course 25th Anniversary Edition. For over a year during 2008-2009 he traveled around the world with Kevin visiting over 20 Countries, 80 wine regions, and 500 appellations and tasted more than 7,000 wines. Among his many professional honors, Mr. O’Connor bears the distinction of induction into the wine world’s most prestigious institutions, including the Commanderie du Bontemps de Médoc- des Graves et de Sauternes-Barsac, the Jurade de Saint-Emilion and Les Hospitaliers de Pomerol.